I pulled into the Jena Junior High School parking lot to watch the motivational assembly put on by my friends Jody, Wendy, Emily and Terrance. I was supposed to help set up and spend some time hanging out with them. But I didn’t help them set up, and I didn’t spend much time with them. That’s because when I pulled into the parking space, I saw smoke coming from under the hood of our minivan. I popped the hood latch & lifted it to see what was going on. It was unexpected and made for a difficult day. Enter Joe. Joe is the maintenance guy at the school. He’s also an ardent follower of Christ. How do I know? Sure he told me of how Christ had changed his life. Sure he told me about how much he loved sharing the love of Jesus with as many people as possible. But that’s not how I knew that Joe was truly a follower of Christ. I knew because he stopped everything he was doing to help me find and try to fix the problem. Others stopped by and asked if everything was okay. Others mentioned they felt badly. But Joe kept working on my vehicle. I went inside for the assembly and Joe tackled his tasks… till I came back out… and then he was back at it with me. Joe wasn’t just curious… Joe cared. Joe was not the only one who showed they cared that day. Two pastor friends, Heath and Jeff, hauled me to auto parts houses (as they are known in the south) looking for the part I needed. When it was unavailable, Heath offered to let me crash on his couch, drive me home or let me borrow their church van to drive myself home till the part could come in the next day. They weren’t just curious. Those guys cared. And they showed it. I ended up not ordering the part and opting… as only a true southern gentleman would… for radiator stop-leak and gorilla tape to patch up the leak and drive the 45 miles home. And guess who helped me do the job right? Joe. Jesus said that people in this world would know that we are committed followers of His when we truly express our love for each other. 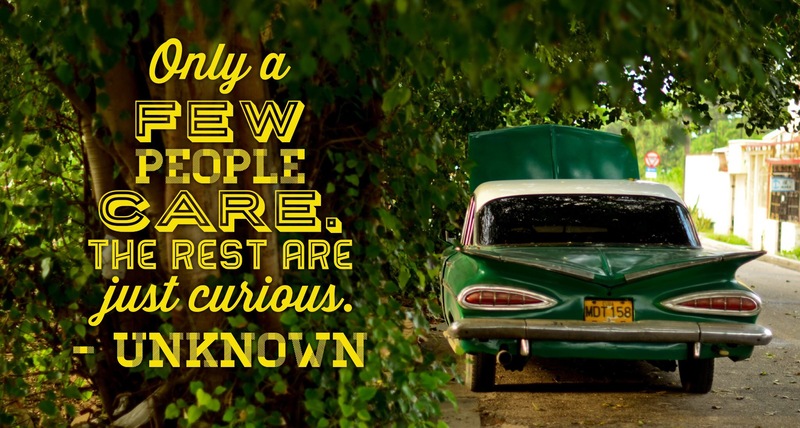 In other words, we we’re not just curious, but we really care for each other. Joe may not realize it, but he inspired me this week. He inspired me to express my care for others in tangible ways instead of just being curious. So thanks, Joe! And I hope I can be as caring as you. Next Post: Do You Have A Dream?